Has Einstein's Limit on the Speed of Light Been Broken? A consortium of 174 scientists at the CERN and LNGS laboratories announced on September 23, 2011, that they had observed neutrinos traveling 0.0024 percent faster than the speed of light.1 If true, this could unravel Albert Einstein's theory of relativity, or at least cause it to be modified. The famous formula E=mc2 has stood firm for over 100 years and has been incorporated into much of our understanding of space and time. Would such a finding impact recent creationist research? Neutrinos are subatomic particles emitted, for example, during radioactive decay or by the sun's nuclear reactions. Neutrinos are very small and pass through matter with ease. To detect neutrino oscillations, the Super Proton Synchrotron at CERN (European Centre for Nuclear Research) in Switzerland created a beam of neutrinos and directed it through the earth toward an underground target at the Gran Sasso Laboratory (LNGS) in Italy 730 km (453.6 miles) away. 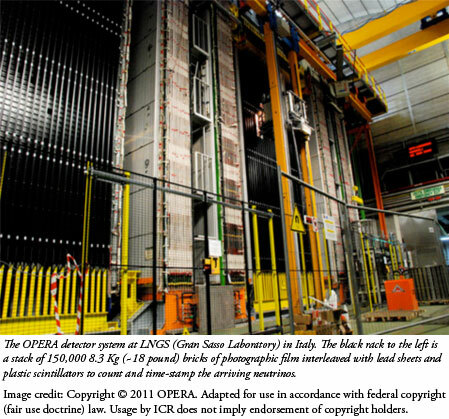 The equipment was also well suited to determine the neutrino velocity with high accuracy. The authors of the technical report, available on arxiv.org, wrote, "It is worth stressing that this measurement [time of flight] does not rely on the difference between a start (to) and a stop signal but on the comparison of two event time distributions. "1 In other words, the time of flight is not measured for a single particle but by a statistical method applied to the distribution of arrival times from multiple neutrinos. The baseline was also measured to a high precision. The procedures used and precision found in these measurements are raising physicists' eyebrows worldwide. Changing the limits on the speed of light will not be easy, so researchers have been searching for sources of error. The most likely source would seem to be in the method of fitting the time distributions of protons leaving CERN with the time distributions of neutrinos arriving at Gran Sasso. The two distributions are fit to each other, and when they line up that gives the time of flight, and thus the speed. However, all the protons are included in the time profile at CERN, but by the time the beam gets to Gran Sasso it has fanned out so that the OPERA detector system sees only some of the neutrinos. So, any correlations between the production time of the neutrinos and the angle at which they are produced could lead to an uncertainty in the fit between the CERN and OPERA neutrino profiles, and hence an uncertainty about their speed. Also, the method by which the statistical error was computed may not adequately account for the variance between the neutrino and proton probability distribution functions. These concerns are standard fare between theoretical and experimental science. So, it's likely that this controversy will continue for some years to come. In recent years, Russell Humphreys,2 John Hartnett,3 and Robert Gentry4 have each used the general theory of relativity to build a case for their young-world cosmogonies. Each has solved various aspects of the mass, space, and time issue in a young universe by solving Einstein's field equations using different boundary conditions or suggesting additional coordinates. For example, Humphreys has suggested that rapid expansion of the cosmos at creation and the Flood would have caused time to be accelerated at distances far from earth, permitting light to reach earth from outer space in only thousands of years, not billions. These theories suggest that the effective speed of light relative to an earth timeframe can change. However, the general theory of relativity they used assumes the speed of light is constant and independent of all moving frames of reference. If CERN research is verified— that is, if the speed of light can change in the earth's frame of reference—the equations of relativity may become even more complex than they are currently. Creation cosmogonies are not likely to be nullified by the speed of light not always being constant, but could be further complicated by it. On the other hand, if the speed of light is found to be changeable under various conditions, this lends credence to the creationist view that basic physical constants are changeable. ICR's RATE project found evidence that nuclear decay rates have changed in the past.5 Since decay rates, the speed of light, and other constants are tied to each other through physical laws, differing speeds of light would make it easier to justify the view that many parts of the cosmos could have been affected by processes that operated in different ways and at different rates in the past. Adams, T. et al. 2011. Measurement of the neutrino velocity with OPERA detector in the CNGS beam. arXiv:1109.4897v1. Humphreys, D. R. 1994. Starlight and Time. Green Forest, AR: Master Books. Hartnett, J. 2007. Starlight, Time, and the New Physics. Powder Springs, GA: Creation Book Publishers. See links provided on The Orion Foundation website at www.orionfdn.org. Vardiman, L., A. A. Snelling and E. F Chaffin, eds. 2005. Radioisotopes and the Age of the Earth: Results of a Young-Earth Creationist Research Initiative. El Cajon, CA: Institute for Creation Research and Chino Valley, AZ: Creation Research Society. Article posted on October 5, 2011.